The Role of Nang Nak in Thai Media and Imagination: Dangerous Ghost or Protective Goddess? 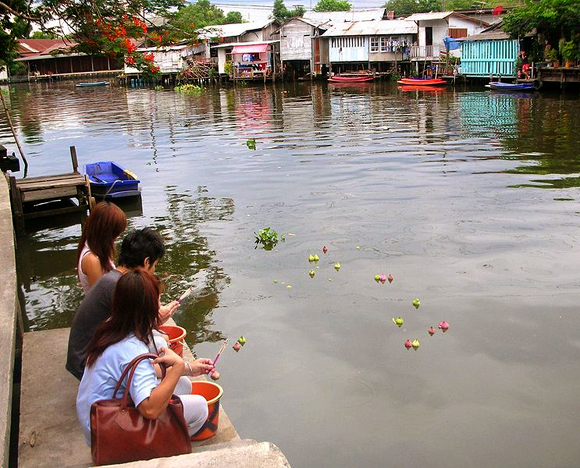 The story of Nang Nak (Mae Nak Pra Khanong) is summarized in the terms of the hugely popular film Nang Nak (1999). Directed by Nonzree Nimibutr, the central features of the story are explained in terms of their popular religious and cultural significance. An attempt is made at understanding why Thais are so fascinated by this story. The importance of the Mae Nak Pra Khanong shrine is explained and her role as a popular beneficial Mother Goddess figure is discussed. Both the story and the worship at the shrine reveal some of ambivalence experienced in Thai culture towards women in their role as child bearers and wives. Issues will include: the ambivalence to the feminine which many men in Thai culture exhibit, expressed through tales female power, through blood pollution, or emotional and psychological manipulation. The dangers inherent, especially for women, of surrendering to emotional attachments that are too powerful, even in marriage. Other messages to be found in the story and the shrine worship of Mae Nak include: the importance of correct use of ritual power in healing and exorcism and the superior power of Buddha Dhamma as embodied in the person of a meditationally, ethically and ritually accomplished monk. The advisability of consulting the appropriate specialist in the field. Depending on the needs of the situation, this field may include the supernatural and spirit world of powerful female deities, as well as the power of Buddhadhamma as mediated by wise and ritually expert monks. Every Thai knows the story of Nang Nak (Mae Nak Pra Khanong). Every Thai resident of Bangkok knows her beautiful and popular shrine in the grounds of the Mahabhute Temple by the Pra Khanong Canal (Sukhumvit 77, Soi 7). Here she is worshipped as a Goddess, and receives offerings, especially from women devotees. Whenever I have visited the site, the offerings and activity around the Mae Nak shrine always exceed that around the Buddhist Temple itself. 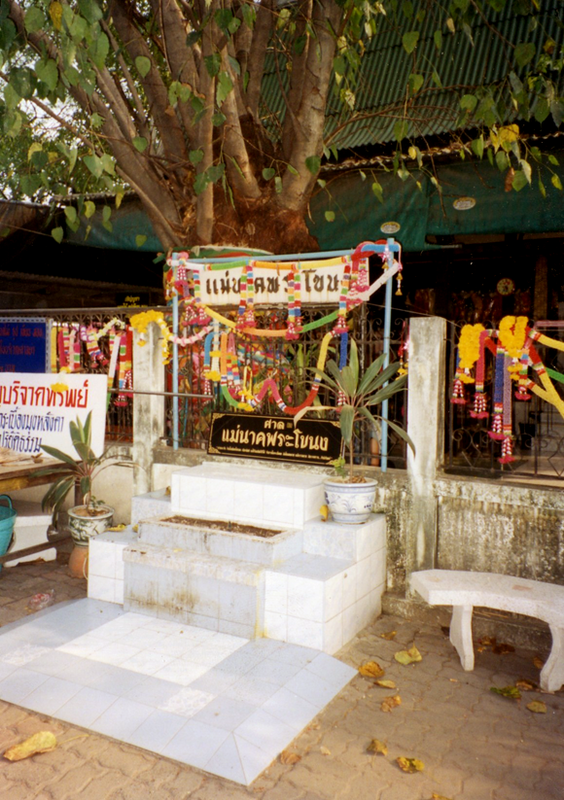 Other Nang Nak shrines have sprung up over Central Thailand in the past 100 years. McDaniel (2010) notes that she has been the subject of 22 Thai ghost story movies (Nang Pi) since 1936, as well as featured in TV series, comic books, traditional Likay Theatre (until the story was dropped as being too frightening). Wong (2004) notes that Nang Nak’ s name is often invoked to pacify crying children, as in, “Be quiet child or Nang Nak will come and eat you”, and the game, where her name is shouted and children scream and run to hide. No historical record of her existence is available, but her “reality” in the psyche and imagination of Thai people cannot be questioned. For most Thai, her story is true and her current identity as a revered and protective Goddess is assured. The story is beautifully retold in the hugely popular 1999 movie, directed by Nonsree Nimibutr, “Nang Nak”. Nak was the faithful and loving wife of a soldier, who dies in childbirth while her husband is away fighting the Burmese. The husband, Nai Mak is injured but survives, due to the intervention of a powerful monk Ven. Somdet Tho, who treats him with herbs and sacred Pali protective chants. The soldier returns to his village at Pra Khanong (now part of greater Bangkok, Sukhumvit 77, Soi 7) to resume married life. Nai Mak doesn’t realize that his, wife Nang Nak is a ghost, whose psychic connection to her husband was so powerful , that her life force or spirit (winyan) does not move on to be reborn , but remains, waiting for her husband. She is a powerful ghost and creates the illusion that she and the baby are still alive. Only Nai Mak sees the illusion and lives with his wife, blissfully ignorant of her true nature. The villagers know Nang Nak is dead; but the jealous ghost kills anyone trying to warn the husband. She terrorizes anyone who tries to thwart her, including the midwife who tried to prevent her death, and who tries to warn Nai Maak of her real identity. The powerful ghost resists the villagers’ attempts to exorcise her, and kills a local shaman/exorcist (Mor Pi) who uses Brahmanic chants and yantras, which are ineffective. She terrorizes the ineffective local monk, and she punishes him by polluting the image room of his temple by leaving her dirty footprints on the ceiling. The duped husband finally realizes his wife is not human, in the famous episode of the lime fruit. She is drops a lime while making somtam. It slips through the floorboards of the traditional elevated house and falls to the ground. Instead of running down the stairs to get it she simply extends her arm through the floor boards and reaches out over three metres to pick up the lime. Realizing that Nai Mak knows the truth she goes on the rampage through the village, killing livestock and destroying things. The terrified Nai Maak takes refuge in the Mahabhute Temple and sends for Venerable Pra Somdet To. Surely, the monk who saves the soldiers life will know how to deal with this problem. Somdet To arrives with is novice assistant. He calmly sits down on the ground in front of Nang Nak’s open grave. He summons her in a direct and laconic tone. She appears rising out of the grave. While everyone else goes into shock and are afraid of the ghost, Somdet To is not affected. He simply chants for hours. The night passes and the sun rises. Somdet To subdues Nak through the chanting and then explains to her in simple Thai that she must give up her attachment to Mak and this world. He instructs Mak to come and embrace his wife for the last time. They cry and proclaim their love for each other. Then Somdet To chants a final incantation and then states “gatha mun it” (“these are the foundational verses”). Her corpse desiccates in front of his eyes and the ghost disappears. His novice walks over to the corpse and using a hammer and chisel removes a large piece of her forehead bone. He gives it to Somdet To and Somdet To tells the local monk that he has captured Nak’s spirit (winyan) in the bone and that she cannot bother his village anymore. Later Somdet To is seen inscribing a yantra on the bone writing the khom letters and whispering to himself “ma, a, ua.” “This the well-known Sanskrit mantra chanted backwards. Aum is the sound believed by Buddhist ritual experts in the region to represent the entire Pali Buddhist canon (Tripiṭaka). Mak is then seen cremated his wife’s corpse as an ordained monk. As Mak is shown paddling his canoe into the distance, the narrator states that the forehead bone was used by Somdet To as a belt buckle for years and then handed down to his novice and then to a Thai prince and then lost. A detailed discussion of the biography and hagiography of Somdet To can be found in McDaniel 2011 pp53-71. On one level her story and its popular appeal can be ascribed to its reaffirmation of core Buddhist teachings and values. A disruptive and dangerous ghost is pacified and tamed by the power of Buddha dhamma as represented by the powerful ethical and ritual authority of the figure of Somdet To. His ritual and ethical power is established by his healing of the injured Nai Mak when he was still soldier. Somdet To also seems to know of the soldiers deep psychic connection to his wife, and that something has gone wrong, because he urges the soldier not to return home but ordain as a monk. The story also highlights the limitations of that power, as indicated by the failure of the ineffective local monk to pacify the ghost. Ven. Somdet To exhibits the higher order powers (iddhi) well as the virtue (sila) and compassion (karunna) of a monk advanced in meditative practice and ritual mastery. He is not hostile, but shows compassion to Nang Nak, as well as to Nai Mak. He acknowledges their love, allowing them to embrace for a last time. But he insists that they must both accept change and impermanence (anicca) as inevitably and be reconciled to death, as part of the natural order. But of course this is only part of the story and the message. Mae Nak is not restricted to the buckle, only her negative energy and dangerous form is captured there. Her new identity as the protective and powerful Goddess is assured. Though located in the sacred space of the Mahabhute temple, the style of worship of Mae Nak is not that of orthodox, canonical Buddhism. It is localized and popular worship, with the expectations of blessing and benefits being bestowed on her worshippers. The usual offerings of flowers, candles and incense and gold leaf are made, but clothes supplement them for both mother and child, cosmetics for the mother, diapers and toys for the child. She is said to be particularly kindly to soldiers, because her husband was one. She hates military conscription, because it was that which took him away from her. She is especially popular in the days preceding a lottery draw. She has appeal for young men called up for the other kind of lottery, the notorious red bean black bean draw, which decides whether the young man does military service or not. Mae Nak hates conscription so she will help to ensure that those who make the appropriate offerings to her avoid being called up. Even worried mothers of teenage military age sons approach her on this matter. The status of Mae Nak as a trans-regional Goddess, not just a local one, and her extra Buddhist identity, while not contradicting Buddhism, does indicate that she is fulfilling needs not ordinarily addressed by orthodox or elite Buddhist teachings. Wong (2004) argues that she represents the universal paradox of femininity. Another way of saying this is to say that her story and her religious status reflect the ambivalence common to representations of and attitudes to women in many Asian cultures. McFarlane (1994, 2001) discusses the roots of this ambivalence particularly in Chinese culture. In order to have status and a role in traditional Asian patriarchal societies a woman must be a wife and a mother of sons. But the process of becoming a mother, ritually and morally reduces her, as well as presenting great dangers. It is through bearing and rearing children that a woman achieves what status she has. But even here there is danger and ambivalence. Apart from the physical risks of pregnancy and childbirth, the traditional Asian cultures regard these processes as ritually and morally polluting. Menstrual blood and birth blood are regarded as dangerously polluting, especially for men. In Thai and Chinese culture, strong taboos exist to prevent men from being damaged by it. It extends to the taboo of not washing male and female underclothes together, not hanging them on the same line, of men avoiding menstruating women and not walking under any women’s underclothes hanging out to dry. Seaman (1983) has the most detailed account of these taboos and practices in a Taiwanese context, many of which exactly match those found in Thailand. The following passage, taken from the life story of a Chinese servant, told to the author, Ida Pruitt in the 1930s, cited by McFarlane (2004). It reflects the power and the burden faced by women in traditional patriarchal Asian cultures. This passage articulates a sense of the power and solidarity of women in traditional Asian societies, as well as the tremendous burden of responsibility that their role in the family network imposes on them. Socially and supernaturally, for a woman to die before marriage, or die before producing children was, and still is, a serious and threatening matter. It is not surprising that in Chinese and Thai cultural view, the majority of unhappy and troublesome ghosts are women (Potter 1974 Harrell 1986). Their more marginal status with its potential for serious disjunction seems to be reflected in the supernatural order. Many of these unhappy ghosts are girls or women who died without marrying, or died in childbirth, or women whose families have neglected to, or been unable to, make proper funeral and mourning provision. McFarlane describes (1994) of the ritual mechanisms for coping with a troublesome or unhappy ghost who has died before marriage, and therefore is without status in a family is the practice of ‘ghost marriage’. This is still practised in Taiwan, Hong Kong and the New Territories. Through ghost marriage, the girl’s spirit is married either to another spirit or to a living man. The wedding service is carried out using paper models of the ghosts, and on its completion, the girl’s spirit tablet is then placed on the ancestral altar of the family into which she is married. It is a purely formal arrangement, if a living man has agreed to act as her partner, usually involving a fee paid by the dead girl’s original family, then after the marriage he is free to marry in the normal way, since the girl’s status as a member of his family has then been achieved. A Taiwanese friend of mine was in his early life and the early years of his marriage, a poor trader in a market in Tainan. With his wife’s agreement, he contracted a spirit marriage with a young girl who had died childless and unmarried. He showed me the girl’s spirit tablet installed on his home altar. He attributed his later success in life, his large and healthy family, his wealth and extensive property, to the positive influence of this girl’s spirit. He is a kind and generous man, but he did not regard himself as deeply religious. His contracting of a spirit marriage was by no means unusual amongst Hokkien Taiwanese in the towns and villages of central and southern Taiwan. When he heard I was studying the local exorcism ritual, lore and beliefs of the traditional Sung Chiang martial arts troupes, he insisted that I stay at his home, and use it as my base for research in central Taiwan. He insisted on taking me to many temples and networking on my behalf, to ensure I met the right people with knowledge of plague protection rituals, procession troupes and martial arts exorcism. In the case of the Nang Nak story the dangerous ghost was dealt with by using a different ritual mechanism, the power of Buddha dharma as represented in the person of a particularly wise, ritually skilful and compassionate monk, Somdet To. The basic nature of the problem is that traditional Chinese and Thai cultures see women’s sexuality, and reproductive power, while necessary, are potentially very dangerous and threatening. In emotional terms, it could be said that that marriage, and an emotional attachment which normally accompanies marriage, can have its dangers. In the 1999 movie the power and tragedy, and the appeal of the Nang Nak story is that it starts out of as a conventional account of an ordinary couple, falling in love and and getting married. Their psychic connection or dependency is initially not seen as negative or problematic. They are devoted to each other; Nang Nak is a faithful and loyal wife. Somzree’s movie depicts this very graphically by showing husband and wife having the same stomach-ache when they are miles apart from each other. And when Nai Mak gets wounded and is being attended by Ven Somdet To, Nang Nak is undergoing the painful labour which leads to her and the child’ death. Their deep psychic bond and attachment does become a problem when it causes Nang Nak to become the terrible ghost who will not let her husband go. She becomes jealous and vengeful, and of course dishonest in concealing her death from her husband. As Wong (2004) points out, as a ghost wife she shows some terrible character traits, which are condemned in traditional Thai and Chinese culture; such as dishonesty, jealousy. Possessiveness, laziness. The latter is exhibited by her reaching down for the lime with her extendable arm, rather than going downstairs to retrieve it. Even more serious of course, the fact that she is killing people and livestock in the village, as well as disrespecting elders, such as the shaman/exorcist, and worse still disrespecting monks and temples. But all of this terrible behaviour and tragic outcome emerged from the fact that she was a loyal and devoted wife who was dutifully waiting for her husband to return from military service and bearing him a son. So the message of ambivalence is re-enforced, even the wifely virtues of loyalty, devotedness, bearing a son for her husband, can be dangerous and disruptive given the wrong circumstances. Michael Wright (1990) suggests another dimension to interpreting the Nang Nak story and cult of worship. He interprets both her story and her worship as being related to an ancient Pre-Buddhist Earth Goddess Cult involving human sacrifice. Therefore, her killing of people and animals is not just out of jealousy or trying to conceal her identity, but relates to the need for blood sacrifice to replenish the earth. In other words, it is the survival of elements of an ancient Mother Goddess Fertility cult. In support of this interpretation, it may be significant that the earth used to construct the main image of Mae Nak at the shrines is said be taken from several burial grounds of different temples, in a special ceremony. Wong (2004) while not denying this as a possibility, points out that if so, the legend or story as we have definitely points to the superiority of Buddha Dhamma and its overcoming of the need for such blood sacrifices and the superiority of the exercise of ritual based on Dhamma and the demonstrating, by Ven Somdet To, the superior power of virtue and compassion linked to Samadhi ( meditational ) mastery. The story and the worship of Mae Nak (Nang Nak) illustrate some central features of Thai culture and belief. The fascination with ghosts and spirits and their interaction with the human realm and the fearful fascination with female vengeful spirits are very apparent. The dangers of ordinary married life and childbirth, which confront women in a traditional patriarchal society. The ambivalence to the feminine that many men in Thai culture exhibit, expressed through tales female power, through blood pollution, or emotional and psychological manipulation. The dangers inherent, especially for women, of surrendering to emotional attachments that are too powerful, even in marriage. The importance of correct use of ritual power in healing and exorcism and the superior power of Buddha Dhamma as embodied in the person of a meditationally, ethically and ritually accomplished monk. The advisability of consulting the appropriate specialist in the field; so for exorcism of a dangerous ghost you need a wise and powerful monk like Ven Somdet To. But for good luck in the lottery draws, to win a fortune or avoid military service; you need the kindly intervention of a benevolent Goddess, Mae Nak, suitably worshipped and given offerings at her shrine. None of the suggested explanations of the Thai fascination with Nang Nak and her shrine are contradictory, or at variance. As a culturally embedded story, with powerful, mythic, ritual and religious messages, the Nang Nak story and Mae Nak shrine and its rituals, are complex and multi-dimensional, therefore several layers of meaning and interpretation are inevitable and appropriate. In addition, no real tensions exist between the orthodox Buddhism of the Mahabhute Temple and the worship at the shrine. People approach these two centres of religious power to meet different spiritual and practical needs. So for ordinary Thai believers, they peacefully coexist. Note: in the interests of clarity and out of respect for the Goddess, I am using the name “Nang Nak” when discussing her identity in life and then as a ghost; and I use the more respectful name, “Mae Nak” when discussing her identity and roles as a Goddess at her shrine. McDaniel, J. “The Emotional Lives of Buddhist Monks in Modern Thai Film” in Journal of Religion and Film Vol. 14, No. 2 October 2010. Retrieved from: http://www.unomaha.edu/jrf/vol14.no2/McDanielEmtionBuddhist.html. McDaniel, J. (2011) The Lovelorn Ghost & the Magical Monk. Practicing Buddhism in Modern Thailand. Columbia University Press, New York. Movie: Nang Nak (1999), Directed by Nonzree Nimibutr (in Thai). Harrel, S. (1986) ‘Men, Women and Ghosts in Taiwanese Folk. Religion’ in Bynum, C.W. Harrell, S. & Richman, P. eds. Gender and Religion: On the Complexity of Symbols. Boston: Beacon Press. McFarlane, S. (1994) “Chinese Religions” in Jean HOLM (ed). Women in Religion, ch. 7, Pinter Publishers. Potter, J.M. (1974) ‘Cantonese Shamanism’ in Wolf, A.P. (ed), Religion and Religion in Chinese Society, California: Stanford University Press. Pruitt, I. (1967) A Daughter of Han: the Autobiography of a Chinese Working Woman California: Stanford U.P. Seaman, G. (1983) ‘The Sexual Politics of Karmic Retribution’ in: Ahern, E.M. & Gates, H. (eds). The Anthropology of Taiwanese Society, California: Stanford U.P. Wright, M. (1990) “Sacrifice and the Underworld: Death and Fertility in Siamese Myth and ritual” in Journal of the Society, Bangkok. Wong, K.F. (2004) Nang Nak, The Cult and the Myth of a popular ghost in Thailand, in Siraporn Nathalong (ed) Thai Folklore. Insights into Thai Culture, Bangkok, Chulalongkorn University Press.